In the US, we've already engaged in our traditions of watching a giant ball drop and making out with a stranger, but in many parts of East Asia, things are just starting to get real. The Lunar New Year ushers in the Year of the Pig on February 5, which is great news for celebrants on the world’s most populous continent… not so much for actual pigs, given the massive feasts that go down. 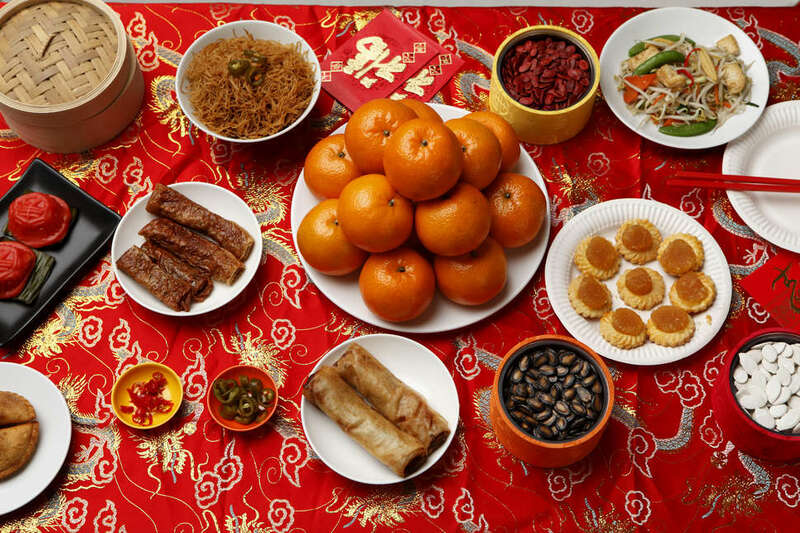 As with any holiday, the New Year has its traditional foods with deep symbolic meanings (oranges = abundance and good fortune, fish = prosperity), which is why we've dug into the traditional eats from various cultures to show you what you're when you settle for cheap champagne and Ryan Seacrest. 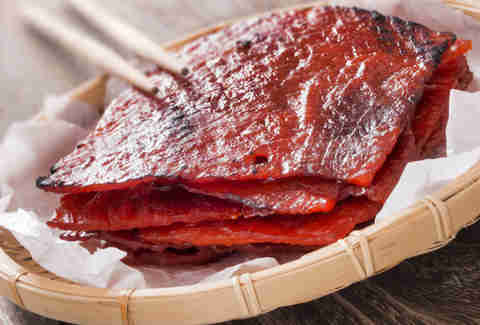 China's salty and sweet answer to beef jerky can be found all year round, but it's especially prevalent when the New Year rolls around in the mainland, Singapore, and Malaysia, and is often given as a gift. This is way better than that mug your secret Santa gave you. Translated as "prosperity toss,” yusheng is a salad of raw fish, veggies, and other ingredients that's popularly served in Malaysia, Singapore, Indonesia, and China as a communal dish, with everybody digging in family style. It’s a symbol of prosperity, as the name implies. It is not recommended you actually throw it at your dinner guests, though given the prevalence of political talk at the dinner table, you’d be forgiven for ignoring that advice. 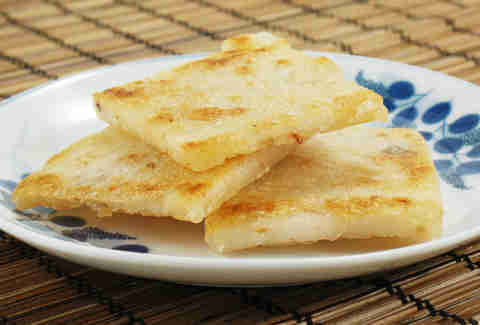 A Vietnamese treat so essential to Tet that it comes steeped in legend, this rice cake is offered up to the ancestors before you can dig into the mung beans and pork hidden within. 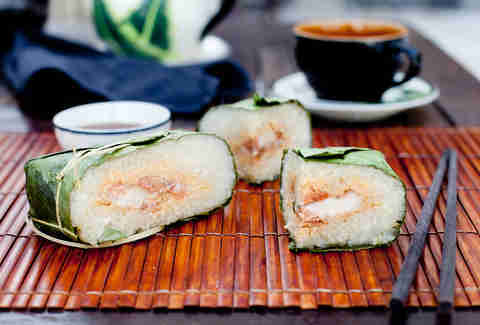 Even better, it's wrapped up in a banana leaf that you unwrap like an edible present. 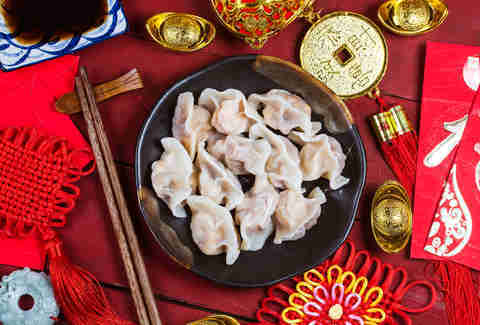 Dumplings are a staple of most Chinese feasts, but during New Year celebrations in China they're as essential as the American tradition of making out with people you don't know. Known as "jiaozi", they're served to represent money and prosperity.They can also be stuffed with other symbolic foods to bring good fortune, such as peanuts for health. Sometimes, there’s even a coin inside, which one could use to help pay for a cracked crown. While Cambodia and Thailand actually celebrate Khmer New Year and Songkran, respectively, in April, we’d be remiss to not include this incredible snack. 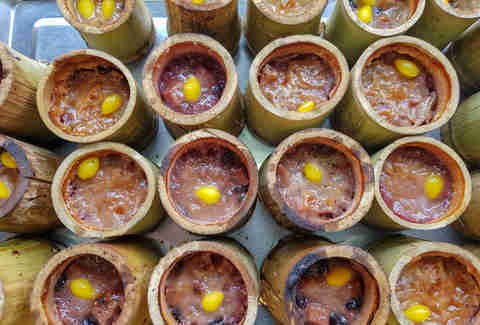 Kralan, or khao lam in Thailand, is a dessert made by stuffing a bamboo pole with rice, red beans, and coconut custard, and then roasting it over a fire. The resulting food is served in the bamboo, which can make you look like a total badass as you peel it like a banana. 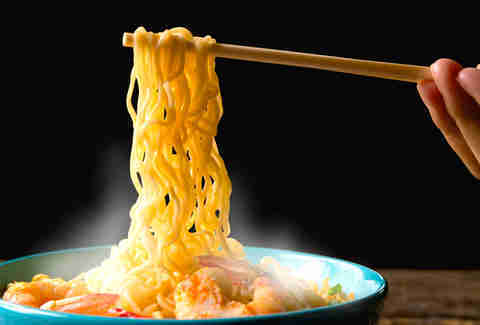 You aren't gonna be finding a lot of bowtie pasta at these celebrations, mainly because they have no place in Asian cuisine, but also because noodles represent long life. The longer the noodle, the longer the expectancy. So if you're in China and you get a plate of ziti instead of the yi mein you ordered, somebody really doesn't like you. Named for the vegetable and not those cards that gypsy used to curse your soul, taro cakes are savory little suckers that you can often find on a dim sum cart, and most definitely at a Chinese New Year celebration, where the pan-fried cakes are a mainstay. They represent achievement and growth, the latter of which you can achieve simply by overindulging in taro cakes. 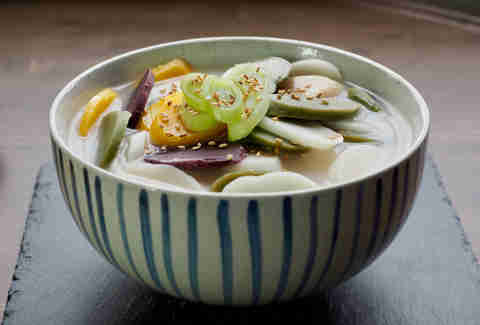 These Korean rice cakes come in about a bajillion different varieties, but during New Year celebrations you're most likely to find them in soup called tteokguk. You'll also find tons of sweet variations, allowing you to really double down on your resolution to eat more rice cakes. Andy Kryza spent five years ghost-writing Lunar New Year horoscopes at a prominent Asian-interest newspaper in the Pacific Northwest. In case you were wondering, he is a metal rooster, and will have a lopsided year. Follow him to your future @apkryza.